Jenna was born on September 15 of 1986. Her dad is a chemist, apparently a very successful one, since according to Jenna, he has Patented some of his inventions. Jenna’s mom teaches strategic digital marketing and runs a consulting company. It is easy to tell from most of Jenna’s videos that her mother is very cool and open-minded and has always been very supportive and encouraging to Jenna’s career choice. Jenna has one (giant) brother who is 2 years older than her. Jenna’s Mom and dad got separated/divorced and her dad re-married another woman (with big boobies, might i add). Her mom’s name is Debby and she has a boy friend and all is going well. As a child, Jenna used to play the clarinet, piano and enjoyed gymnastic activities. At school, Jenna felt “average” and felt as if she didn’t fit in with her smarter classmates (look how that turned out, I bet that very few of your so called “smarter” classmates are as successful as you are 🙂 ). Jenna met her first bf in 9th grade and they dated for 4 years ( I don’t know anything else about him, sorry). Jenna’s second boyfriend, according to her videos, is David Portnoy. He is also the founder of Barstool Sports. According to his blog, David is worth 2 Million dollars. Jenna’s third boyfriend (that I know of), is Max Weisz who is also known as MaxNoSleeves. Max took part in many of Jenna’s videos while they were together and then started his own Youtube channel. It is interesting to see that older videos on his channel ( those including Jenna) have many hundreds of thousands of views each, but the more recent ones have fewer than fifty thousands views. Jenna Marble’s: why did I ever go to college? After Jenna got her Masters degree, she did many part-time jobs, none of which had anything to do with her masters degree. She did go go dancing and bar-tending and worked in tan saloon as well. Then one day she met her neighbor (while she was locked out of her apartment), he happened to be the founder of Barstool Sports. They started dating, and soon after, he hired her to work for his blog. He also taught her how to blog and how to make funny videos. So one day after leaving work, she went home made her famous video, How to trick people into thinking you’re good looking. This video now has more than 60 Million views. 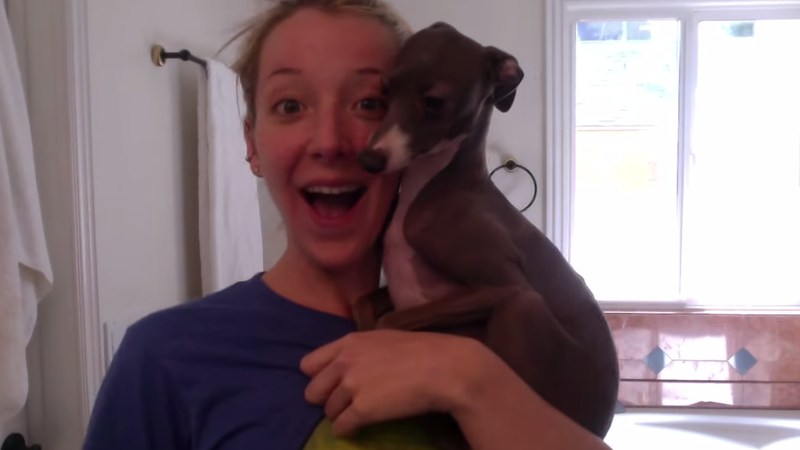 David, then her boyfriend and boss, put Jenna’s video on his website (partly the reason why the video went viral so fast, the other reason is that Jenna Marbles is awesome and hilarious). David helped create her first site, “Stool lala”. However, she didn’t enjoy it much and stopped writing in it after 6 months, the site is no longer live. Jenna realized that doing funny videos and making people happy is what she loves doing and that is probably the secret for her success. Jenna eventually quit her job in Barstool Sports and her many part-time jobs and she became a full time Comedian / Vlogger / Celebrity 🙂 . According to Barstool Sports, Jenna makes more than 4 Million dollars a year.